Deontay Wilder had to be pulled away by the referee after knocking out StiverneDeontay Wilder told Anthony Joshua "I declare war upon you" after retaining his WBC heavyweight title with a first round knockout of Bermane Stiverne.Wilder knocked Stiverne to the canvas with a fierce right before flooring him again with a barrage of punches.Stiverne was then knocked out as Wilder caught him with some brutal punches, including a left-right combination. "I've been waiting on that fight for a long time now. "I declare war upon you. Do you accept my challenge? 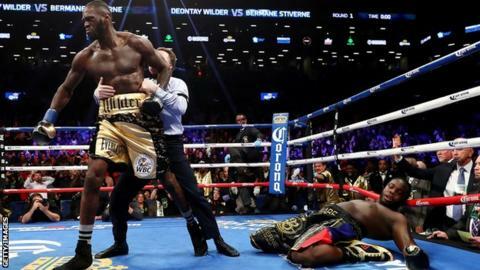 "American Wilder appeared to dismiss the prospect of fighting Britain's Dillian Whyte, who last weekend won an eliminator to put himself in a prime position to compete for a world title by claiming the vacant WBC silver heavyweight crown.Whyte has racked up six successive victories since losing to Anthony Joshua in December 2015, and after Wilder's win wrote on Twitter:[/i] "Well done @BronzeBomber but let's do this work Feb 3 at the O2. I ain't never scared, fact. Will fight anyone anytime." However, Wilder said: "They are trying to give me a peasant in Whyte. A king doesn't chase the peasants. A king takes kings. I want Joshua. If he doesn't give me the fight we have other plans," added Wilder. "The world wants Joshua, the world wants Wilder, I want Joshua. Joshua come and see me baby. No more dodging, no more excuses. Make the date, don't wait. Let's see who is the best. "Wilder was taken the full distance for the only time in his career when he beat Stiverne on points to claim the WBC belt in January 2015.This time around he finished the fight with seconds left in the opening round as he took his undefeated record to 39, 38 by way of knockout.